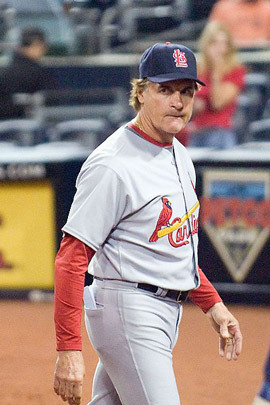 Tony La Russa’s years managing the Cardinals cinched his election to the Hall of Fame. Photo credit: SD Dirk. This edition, another in a series of chats with newly-elected Hall of Famers, focuses on Tony La Russa’s first weeks as Cardinals manager in 1996. La Russa talks about his switch to St. Louis from Oakland, and rumors he had been interested in a return to the White Sox the previous off-season. Ken Hubbs shows off his batting stance. This edition features the audio of the “Tenth Inning” show with Jack Brickhouse after the Cubs’ 4-3 victory over the Houston Colt .45s on Sept. 1, 1963. Cubs second baseman Ken Hubbs is the guest. The clip likely is the last Chicago TV interview Hubbs gave before dying in the crash of his private plane in Utah on Feb. 13, 1964. “Diamond Gems” originally aired this interview on Aug. 5, 1997. 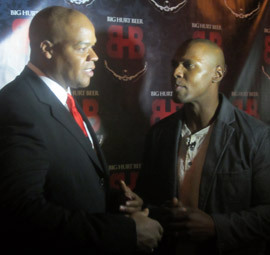 Frank Thomas built up enough of a reputation with the Sox to launch his own beer brand in Chicago, as Thomas (left) is depicted doing in 2012. Continuing a series of vintage talks with newly-elected Hall of Famers, this interview from early in the 1998 season looks at all-time White Sox hitter Frank Thomas at the peak of his career and his views about team leadership. During this time, Thomas was teamed for two seasons with controversial slugger Albert Belle. The ’98 campaign would prove to be the last of nine seasons the Big Hurt would work at the heart of the lineup alongside future Sox manager Robin Ventura. 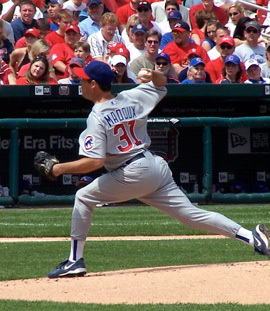 Greg Maddux had his No. 31 uniform number, shared with fellow Hall of Famer Fergie Jenkins, retired and flown from the Wrigley Field flagpole. Photo credit Barbara Moore. TThis edition features excerpts of a May 2009 interview with new Hall of Famer Greg Maddux. “Mad Dog” talks about the concepts of being a good teammate and pitching while tired, the latter when he was asked about the good ol’ days when pitchers completed 20 or more games per season. 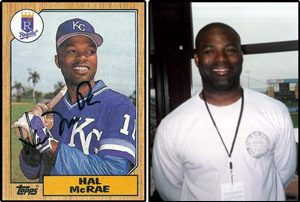 Hal McRae (left) had plenty of grist in his career as a top Royals DH for popular baseball cards. Some of his talent rubbed off on outfielder-son Brian McRae (right), pictured in his post-career gig as a radio announcer and executive at Mesa’s Ho Ho Kam Park in 2004. This edition features an excerpt of a July 1996 interview with Cubs center fielder Brian McRae and his father, Cincinnati Reds hitting coach Hal McRae, a former top DH with the Kansas City Royals. Like all other father-son baseball combos, the love of the game was easily passed down through good genes and exposure to big-league clubhouses at an early age. The McRaes talk about how one generation helped the next one get going in baseball. 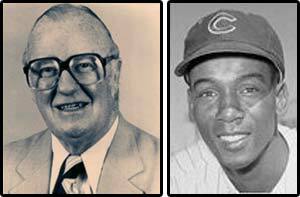 Jack Brickhouse (left) exposed Chicago-area TV viewers to the personalities of Ernie Banks (right) and Billy Williams. This edition features an excerpt of an Aug. 1997 hour-long tribute to Hall of Fame Chicago baseball announcer Jack Brickhouse, taped a year prior to his death at 82. In this clip, Brickhouse recalls how he handled early TV interviews with future Hall of Famers Ernie Banks and Billy Williams, who were reticent to open up conversationally in the start of their careers. Brickhouse also remembers how he worked with Banks when the latter became a part-time WGN sportscaster in the late 1960s. Dallas Green (left) and No. 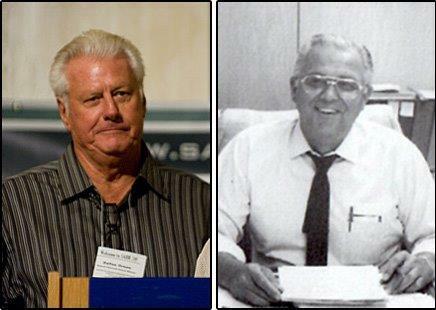 1 aide Gordon Goldsberry set up the most productive Cubs farm system in history in the 1980s, only to see it dismantled after they were forced out by 1988. This edition features an April 9, 1994 interview re-uniting former Cubs GM Dallas Green, then Mets manager, and Gordon Goldsberry, his onetime chief of scouting and player development by then working as assistant to Orioles GM Roland Hemond. Together, they revived a moribund Cubs farm system in the 1980s and produced impact players, led by Greg Maddux, only to be forced out amid heavy Tribune Co. office politics before they could re-stock the Cubs on a long-term basis. At 79, Green is now a special assistant to Phillies GM Ruben Amaro, Jr. Goldsberry died in 1996, just before the Cubs were rumored to have wanted to hire him back, also as a special assistant. 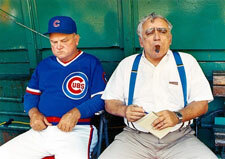 Two baseball legends together with their classic poses circa 1989: Cubs manager Don “Popeye” Zimmer (left) with a semi-scowl and Jerome Holtzman with his trademark dirigible-sized cigar. Soon smoking would be banned in pressboxes and almost all parts of the ballparks. This edition features a 1995 interview in which legendary baseball writer Jerome Holtzman was among a series of guests who dropped by as “Diamond Gems” was taped entirely in the Cubs’ home dugout at Wrigley Field before a game. 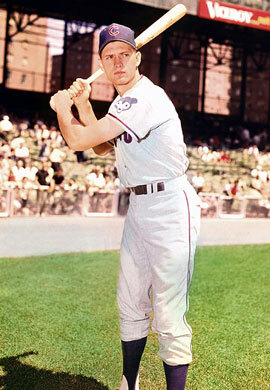 Holtzman’s thoughts ranged from the 1950 All-Star Game at old Comiskey Park he attended to the prospect of inter-league play, which began two years later. 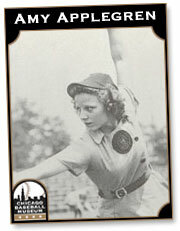 Holtzman had covered baseball for the Chicago Sun-Times, then the Chicago Tribune, starting in 1957. He died at 82 in 2008. Leo Durocher may have been tough for the media to handle, but when money was on the line, as in the sale of his trading cards, he always was a willing photo subject. 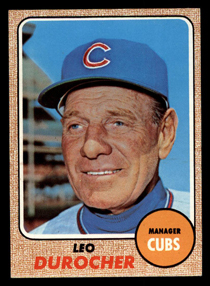 This edition features several gag tapings of Cubs manager Leo Durocher’s radio pre-game show “Durocher in the Dugout” recorded in the late 1960s and played three decades later on “Diamond Gems.” Durocher spared no one in the Cubs traveling party. With his trademark foul mouth, appropriately bleeped here, he skewered those who covered him. Some funny dialogue still slips through in the “clean” parts of the tapes. 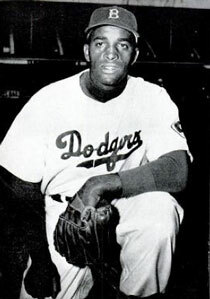 Joe Black was National League Rookie of the Year in 1952, thanks partially to taking the advice Jackie Robinson gave him. This edition features a 1997 interview with Joe Black, who first gained fame as the 1952 NL rookie of the year with the Brooklyn Dodgers. Black distinguished himself in relief for “The Boys of Summer” before being summoned out of the ‘pen to start three 1952 World Series games against the Yankees. Later, Black worked for the Greyhound bus company while handling community work. While passing through Wrigley Field, Black recalled the lessons he learned from Jackie Robinson, a six-year big-league veteran in ’52. Black died in 2002.